St John’s Hospice Light up a Life campaign is now live, allowing you to dedicate a light in memory of a loved one. The lights will shine brightly at St John’s Hospice throughout December to remember those who are no longer with us. This year, for the first time, we have created a radio advert, in association with our friends at The Bay. It is really difficult message to convey in a 30 second radio advert but we are really proud of what has been produced. 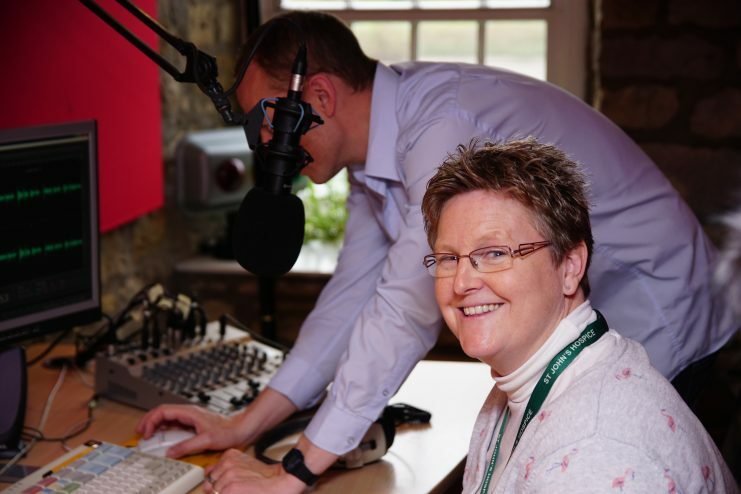 It was a real in house hospice team effort, with a poem about Light up a Life being written by our own Communications Officer Andy Cruxton and being read for the radio by our very talented Volunteer Co-Ordinator Carrie McIntosh. Carrie is a trained actress and relished the opportunity to put her skills to good use in aid of the hospice. Carrie at The Bay studios recording our advert. We have used the audio from the advert to create a short video advert, to help spread the word of Light up a Life to not only raised much needed funds for St John’s, but also to help us take time to remember our loved ones. Please remember to wrap up warmly, especially in Kendal as the church can be chilly at this time of year. Entry is FREE, there is no need to book. Everyone is welcome.